Ceres and Vesta, two asteroids are located in the asteroid belt between Mars and Jupiter in size “unusual”. They are so big that it has named them. Vesta is one of the largest with 580 km long and about 8% of the total mass of the asteroid belt. In fact, it is so big it can be seen with the naked eye. 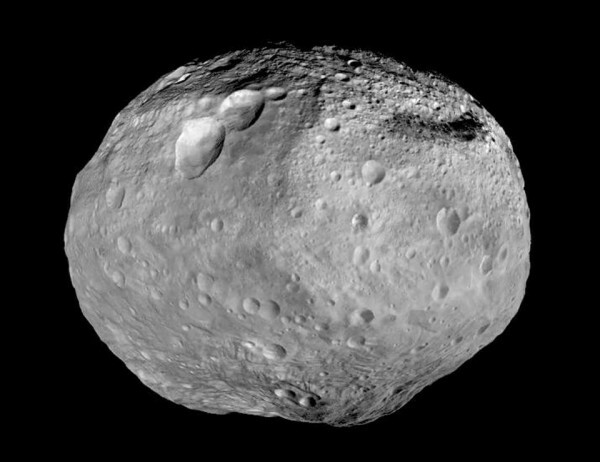 It is believed that many of the planets in the solar system have this large asteroid fragments embedded, ie a piece of the Earth is a piece of Vesta. It is assumed that is composed of iron and nickel with an iron core, mainly. The “housing” consists of olivine, come from ordinary earth. Olivine is a mixture of magnesium, iron, sodium, phosphorus … and the color is between greenish and brown. Come on, land of life. By size, remember, Vesta and Ceres, along with Pluto are called Plutoids, dwarf planets. It is assumed that at the dawn of our solar system, Vesta had a hot core, has had seismic activity. During those early days I fragment is creating what we all know as the asteroid belt and parts were the other planets. The Dawn probe NASA launched in 2007, has been that more information has given us this asteroid / pleneta and is always good not only curious but keep an eye.